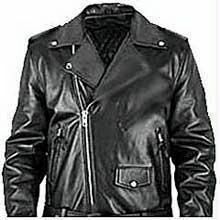 These jackets are made from Cimarron Artifical Leather material. This makes the jacket extremely lightweight and retains the best properties giving maximum warmth. The most essential personal accessory need this winter. The jacket is extremely lightweight and retains the best properties giving maximum warmth. Classic jacket design with additional side entry pocket.Two additional zip pockets for valuables. Made from Cimarron Artifical Leather material. Classical jacket design. 2 Side pockets. Elasticized waist band. Free size, No size option, fitting size 34 inch chest to size 46 inch chest. Available only in Tan Black color. Image shown above is indicative only.